A file with the PPSX file extension is a Microsoft PowerPoint Open XML Slide Show file. It serves as an update to PPS, a format used for the same purpose in MS Office versions 2007 and earlier. PPSX files open directly to the presentation because they're meant to be used just for presenting the slideshow. 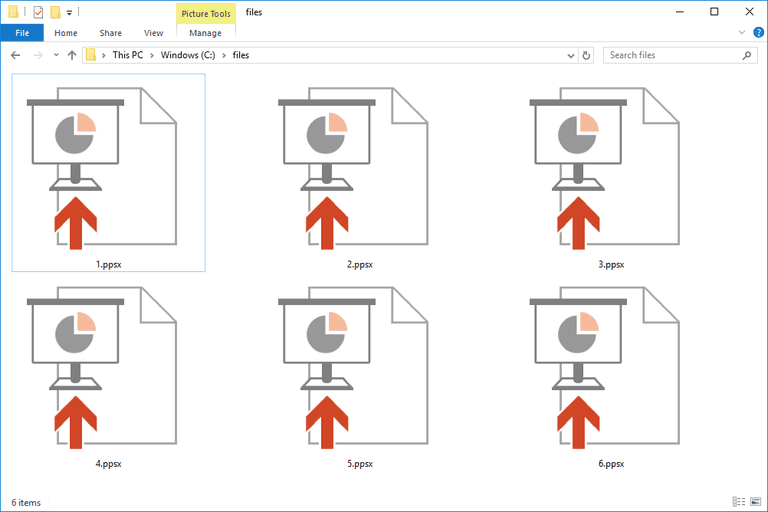 PowerPoint files that open directly into the editing mode are saved with the PPTX extension. PPSX files use XML and ZIP to organize and compress the different parts of the file, just like MS Office's DOCX and XLSX file formats. Microsoft's free PowerPoint Viewer can open PPSX files if you just need to view the presentation and not do any editing. Of course, Microsoft PowerPoint works too, and not just for viewing the presentation but also for editing it. If you're using a version of PowerPoint older than 2010, you can only open the PPSX file if the Microsoft Office Compatibility Pack is installed. Since PPSX files open in presentation mode instead of to the screen meant for editing, you can't just double-click or double-tap the file to edit it with PowerPoint. Instead, you have to open PowerPoint first, and then use the File menu to browse for the PPSX file. Then, you can edit it just like you can PPTX files or any other PowerPoint file. The free Kingsoft Presentation and LibreOffice Impress can open PPSX files too. OpenOffice Impress supports PPSX files as well, but you may need to open the program first, and then choose the "Microsoft PowerPoint 2007 XML" option when browsing your computer for it. Though it isn't free (but there is a trial option), Ability Office is another program that supports PPSX files. If you find that an application on your PC does try to open the PPSX file but it's the wrong application or if you would rather have another installed program open PPSX files, you can accomplish this simply in Windows by changing the default program for a specific file extension. Using one of the free PPSX viewers from above lets you convert a PPSX to PPTX, PDF, SWF, GIF, and many other formats. Some of these formats may only be seen from an Export menu, not the regular Save As menu. For example, PowerPoint can export a PPSX file to MP4 or WMV through the File > Export > Create a Video menu. A free file converter is another way you can convert PPSX to a new format. These are useful if you don't have any of the programs mentioned above. Zamzar, DocsPal, and CoolUtils.com are all online PPSX converters that can save the file to formats like PPT, DOCX, PNG, and JPG. Since the two formats are so similar, it may be as easy as changing the file extension from .PPSX to .PPTX to treat the file as a PPTX file. However, since changing the file extension doesn't actually convert the file, some programs may not recognize it as a valid presentation file.